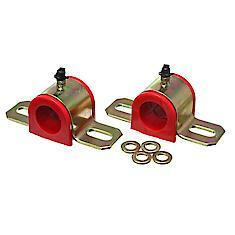 Energy Suspension performance polyurethane sway bar bushings and end links offer the greatest improvement in performance among all the products Energy offers. They make a vehicle's sway bar system much more effective like adding a larger, higher performance sway bar! Economy, increased efficiency, and easy installation are just some of the reasons these products are so popular. Made of Hyper-Flex polyurethane that lasts much longer than O.E.M. rubber bushings. I had never seen any zerk fittings on any sway bar bushings and mounts ever. This is the first time i ever seen these. Figured i would pass along the find. look at that, they are in stock at my local Advance I pass on my way home from work... guess I'll be making a pit stop. Last edited by youngsmith53; 05-13-2015 at 06:10 AM. Last edited by youngsmith53; 05-13-2015 at 11:11 AM. Front and Rear Sway Bar Bushing Serviced with Sway Bar Only!! !